This is an absolutely fantastic chicken recipe that's easy to make with fantastic results. You can have sumptuous, tender roasted chicken in under 2 hours. Wash and pat dry chicken. Mix all ingredients together including salt, pepper, garlic powder, onion powder, yellow corn flour, lemon juice, balsamic vinegar, and olive oil in a small bowl and set aside. When chicken is dry and ingredient thoroughly mixed rub mixture all over (under skin too). Place chicken in a 3 to 4-quart baking dish. Roast until chicken reaches 135 to 140 degrees F on an instant-read thermometer, about 1 hour. Collect juices from dish and baste occasionally, continue roasting chicken until temperature on inner thigh is 165 degrees F, skin is golden brown, and juices run clear, about 30 to 40 minutes more. 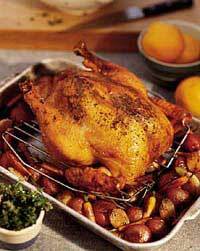 Raise oven temperature to to 450F, return chicken in dish to over while basting occasionally. Cook chicken until temperature on the inner thigh is 165 degrees F, skin is golden brown, and juices run clear, about 30 to 40 minutes more. When completed remove chicken and let rest 10 minutes before carving. If desired you can pour pan juices into a small saucepan and simmer over medium heat until thickened, about 7 to 10 minutes. Taste and adjust seasoning, as desired. Carve chicken and serve. Take 2 medium red potatoes and pierce 3 or 4 times with a dinner fork. Wrap the potatoes in aluminum foil. Place the potatoes along side the chicken roasting dish. Roast with the chicken for 1 hour at 375F. When completed remove the potatoes and let rest for 5 minutes. Open potatoes lengthwise and cover with butter or margarine, sour cream and Jake's Santa Barbara Smoked Rub.